Hey folks, it's Jessica. This is the third installment of Jess's Take on TV. I got some interesting responses on the renewal and cancelation comparisons on the last installment so I decided to make part 2. Without further ado, let's compare five new shows and their different predictions from many sites. Analysis: The Middle has been a strong aspect on ABC Comedy on Tuesdays. Clearly it's not going anywhere. My verdict: Based on ratings, it certainly will be renewed. TVBTN and TVLine are just not optimistic enough. Analysis: One of the highest rated comedies on CBS right now. Also, it got a full season pickup. My verdict: Most of the CBS comedies are down compared to last year. Life in Pieces is a safe bet. I'm betting likely renewal. Analysis: Lowest rated comedy on FOX. It's on a Tuesday. Even FOX's general ratings collapse wouldn't be enough to save this show. My verdict: Certain cancelation, because a 0.7 on a Tuesday just doesn't cut it. Analysis: Woefully rated, and live. Even though it's NBC's #1 comedy on a Friday. Don't expect a pickup. My verdict: This show is very likely to be this year's Cougar Town. Likely cancelation from the network, then a move to TBS. Analysis: After three full seasons, the show needs one more season for syndication purposes. My verdict: You already know my verdict. After this season, The Originals will have 66 episodes. The Syndication Gods demand a fourth season. Question: Undatable will only have 36 episodes after season 3. Could it move to TBS like previous network shows American Dad and Cougar Town if NBC cancels the show? Question #2: Person of Interest is nowhere to be found on the CBS midseason schedule as of right now. 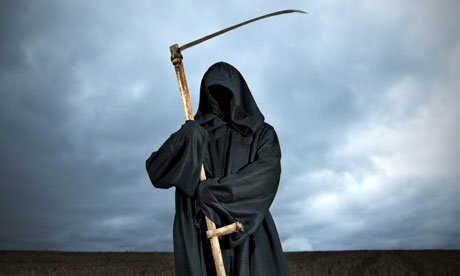 Bill Gorman aka the TV Grim Reaper has already predicted it as "certain to be canceled" before it even airs. Do you think that it's too soon for predictions, even though it's likely Person of Interest's final season?